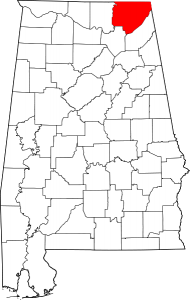 Jackson County Alabama is a county in the Northeast corner of Alabama. The population is 53,227 and the county seat is Scottsboro, Alabama. 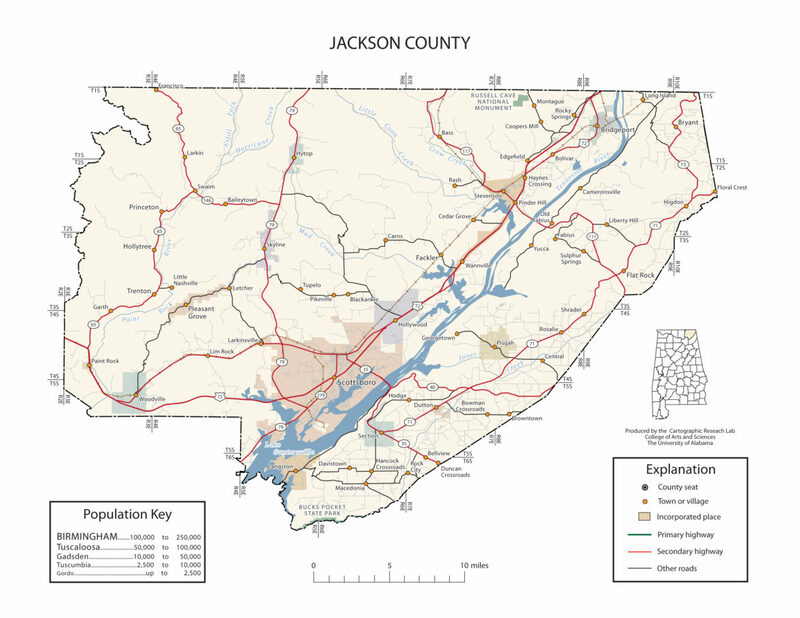 Jackson County was named for Andrew Jackson, general in the United States Army and afterward President of the United States of America. Pisgah is a town in Jackson County, Alabama. Pisgah was first settled in the late 1830s. The first white settlers began to move to the Pisgah area after Indian Removal in 1836, mainly during the 1840s-1850s. A post office was established in 1878, and the community was named for Mount Pisgah, the mountain in the Bible from which Moses viewed the Promised Land. It is included in the Huntsville-Decatur Combined Statistical Area. It incorporated in 1947. As of the 2010 census, the population of the town was 722, up from 706 in 2000. Pisgah is located atop Sand Mountain. The town is situated on a narrow ridge that extends outward from the Cumberland Plateau in western Jackson County. Woodville lies at the base of the plateau to the southwest, Skyline lies along the plateau to the northeast, and the Paint Rock River flows through the valley to the northwest. County Road 8 is the primary traffic artery in Pleasant Groves. Section is located on land where the Cherokee once hunted and lived. The community was originally known as Mt. Zion when the first post office was established. There were communities such as Kirby’s Creek, Gossets Hollow, and Fern Cliff. These communities came together to form the Town of Section. Pioneer settlers came in 1862 to Section, in large numbers. Settlers were required to live on the land for five years before claiming the property as their own. It became known later as “Section” because it was the location of a square-mile parcel of land, known as the 16th Section, required by the federal government to be set aside in support of public schools. Skyline began in 1934 as a cooperative farming experiment known as “Cumberland Farms” under President Franklin Roosevelt’s Federal Emergency Relief Administration. This was one of 43 such projects attempted nationally in depressed areas. It was soon renamed “Skyline Farms” to avoid confusion with another project in neighboring Tennessee. The experiment lasted for a decade before being sold off to private buyers in 1944. The current town of Skyline is located about a mile north of the original farming colony. Woodville was settled about 1815 by Henry Derrick and is the oldest town in Jackson County. It was named for early residents Richard and Annie Wood. Woodville became the seat of Decatur County, Alabama in December 1821, but was attached to Jackson County when Decatur County was abolished the following year. The surrounding area was the site of considerable guerrilla warfare during the American Civil War. Gorham’s Bluff is an unincorporated community, approximately three miles north of Pisgah at the top of Sand Mountain. It overlooks the Tennessee River valley. Currently, Gorham’s Bluff is not a recognized town, but part of the Pisgah area. Gorham’s Bluff has a six-suite lodge and nine cottages. Since 1997, in collaboration with the Gorham Bluff’s Institute, it has served as a venue for the Alabama Ballet in their pre-season. If you would like to become a sponsor, advertise a related location, service or vacation spot that would add to the usefulness of this site, please email us: staff@digitalalabama.com. Our map resources refer to external websites, and as such links are outside of the control of Digital Alabama, they may from time to time fail to work, some may also not be as accurate as we would wish. Important Disclaimer: This locality information is for reference purposes only. You should never attempt to visit any sites listed on Digital Alabama without first ensuring that you have the permission of the land and/or mineral rights holders for access and that you are aware of all safety precautions necessary. Map Location Accuracy: The coordinates listed for many locations are general regional coordinates (not accurate) and should not be relied upon for locating localities (eg with a GPS).